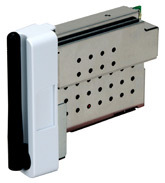 The Lexmark N2050 802.11b/g Wireless Network Card allows you to easily connect your AIO or printer to a network. Wi-Fi certified and is compatible with all Wi-Fi certified devices. Configure (via USB) and manage --- Uses the Wireless Setup Utility to change settings. With Wi-Fi Protected Access (WPA2) personal security, the N2050 offers access control and allows the printer to connect to a secure network.